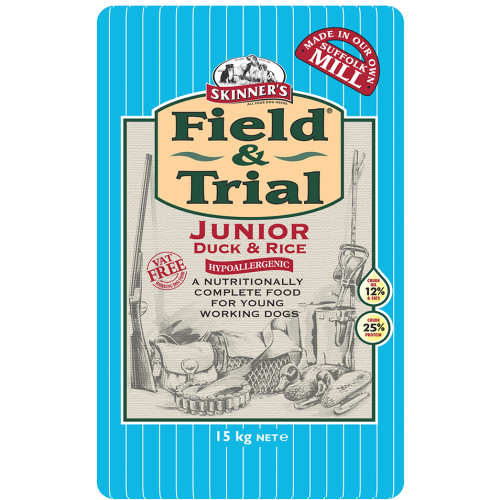 Skinners Field & Trial Junior Duck & Rice is a appetising and completely hypoallergenic dry food made with British duck. It follows on from Field & Trial Puppy Duck & Rice providing a stepping-stone between the puppy and adult life stage. Bursting with all the essential minerals for this vital period of growth and development. It also contains Omega-3, which provides many natural health benefits including the support of brain and eye development. Formulated for young working dogs from 6 months to 18 months of age. Duck meat meal (26.5%), brown rice (26.5%), naked oats, peas, whole linseed, beet pulp, sunflower oil, yeast, marine algae, vitamins, minerals and trace elements, MOS.